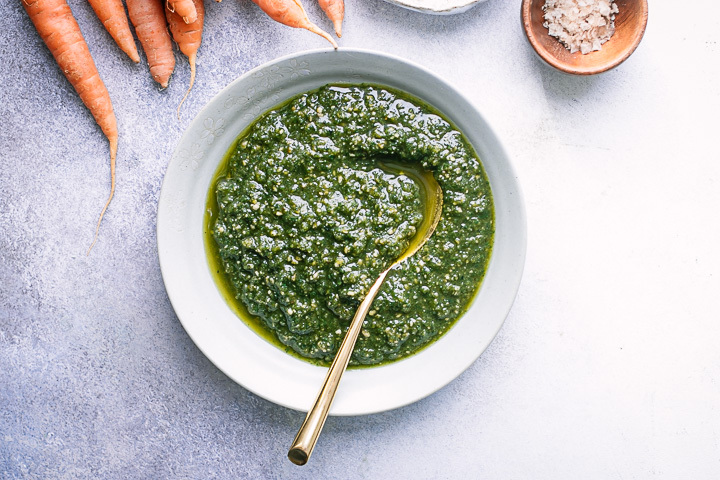 Carrot Top Pesto, a simple pesto recipe made from fresh carrot greens, pine nuts, parmesan cheese, garlic, and oil. A unique food waste recovery recipe! I have something to admit: I’ve been throwing away carrot tops my entire life. Or rather, I buy carrots without their tops and don’t give a second thought to where the carrot tops are going. How many beautiful, nutritious green carrot tops have I wasted because I didn’t know carrot tops could be consumed? I had no idea eating carrot tops was even a thing. But in my quest to become a greener eater, I have been implementing more root-to-stem cooking techniques. Using as much of the edible parts of vegetable as you can is a more sustainable way to prepare and utilize foods but the most important reason for eating carrot tops (or any vegetable, for that matter) is because they are delicious! 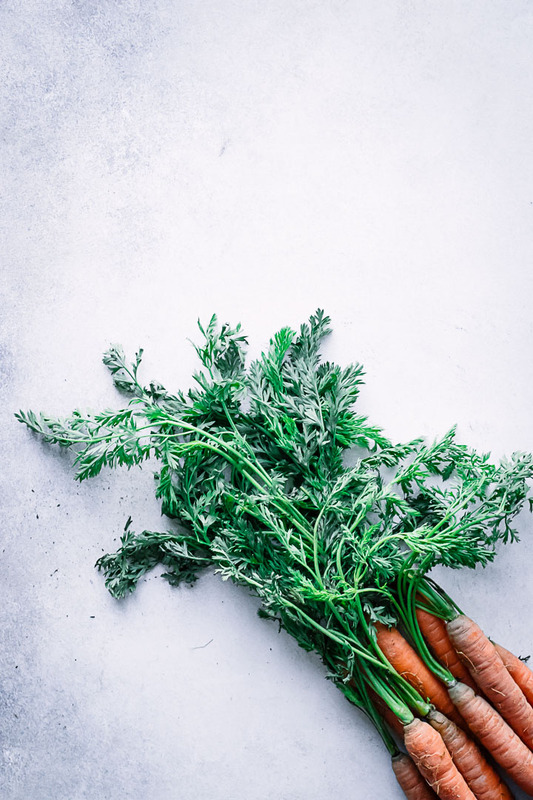 Carrot tops have small, leafy sprigs that are similar to parsley and can be used in any way that you would use a more traditional herb (though they have a much milder taste). 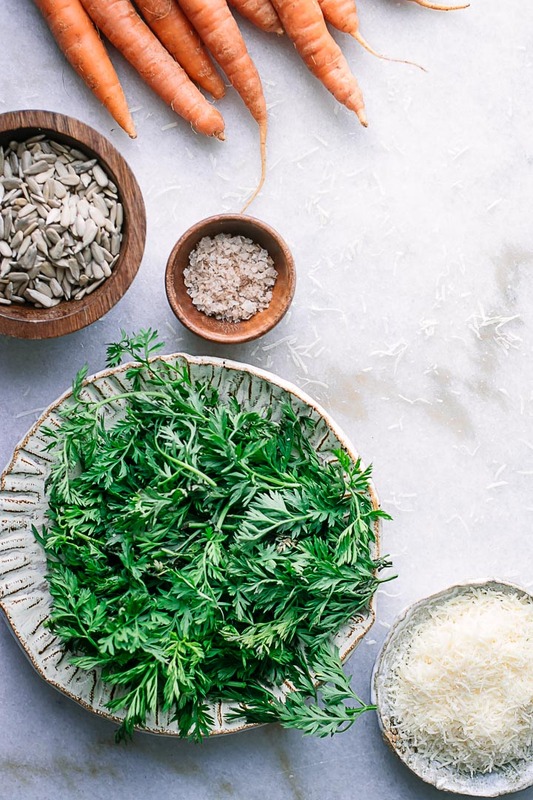 And the perfect primer for using carrot tops is to make Carrot Top Pesto! 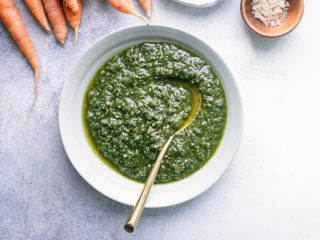 Making carrot top pesto is a unique way to use up carrot greens that would otherwise be wasted and it just so happens to be super simple. First, cut the carrot tops from the carrots. I’ve found that carrot greens generally still have some dirt on them so it’s important to wash the greens thoroughly before using. After the carrots tops have been washed, chop into small pieces and add to a food processor. Add pine nuts (or seeds if you’re avoiding nuts), oil, and garlic and pulse until well chopped but not completely smooth, adding more oil if necessary. That’s it! A simple recipe using food that would otherwise be wasted and not enjoyed. Pat yourself on the back for being a food waste warrior! 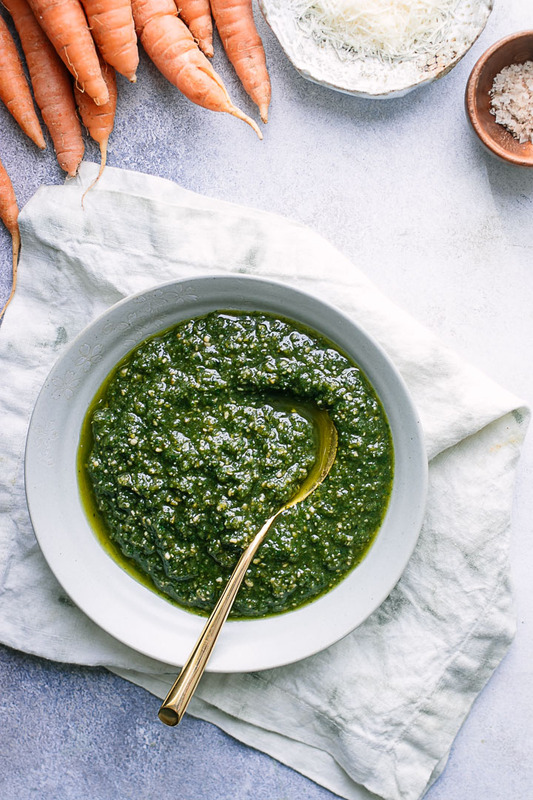 This Carrot Top Pesto is one of my favorite recipes that utilizes foods that would otherwise be thrown away to reduce food waste in the kitchen. I hope it inspires you to think differently about the foods you throw away and helps salvage these perfectly edible scraps into something unique and delicious! Craving more simple sauce recipes? Check out our 5-Minute Nut-Free Chickpea Basil Pesto and Vegan Green Goddess Avocado Dip recipes, both easy sauce and ip recipes that will add a boost of flavor and fun to your meals. Did you make this Carrot Top Pesto? Leave a comment below and rate the recipe to let us know how it turned out. Save this recipe for later by pinning to your favorite sauce Pinterest board and make sure to tag me on Fork in the Road’s Instagram to show me your carrot green creations! Add carrot tops, pine nuts, and garlic cloves to food processor and pulse until chopped. Slowly add in oil and continue pulsing until well combined, but not smooth. Add parmesan, salt, and pepper and pulse a few more times until combined. Use as a sauce with your favorite pasta, vegetables, meat, seafood, or dip. Nutrition: This carrot top pesto is a good source of vitamin and calcium, and is high in protein per serving. It is also rich in healthy fats, which increase satiety and play a role in cell health.